ROUTE was Pune – Bangalore – kurnool (Hyderabad) – Bangalore – Pune in 36 hours. In great attempts it is glorious even to fail – Bruce Lee. This is the quote that inspired me the most after my first attempt. It is the unquenchable thirst for doing the impossible to prove mind over matter & to set an example that hey women out in the world, its possible. If you have what it takes anything is possible. My last failed attempt taught me many things which helped me to sail through or tide over this attempt. Imagine covering 2240 km in 34 hours and failing just short of 200 km to finish. That day itself I had decided that I would do it again. Anyways I’m glorious this time and the credit goes to my belief that its possible. “Courage in the path is what makes the path manifests itself”. Ride began at 7:15 AM with the witnesses at the petrol pump, Police Inspector of khed shivapur Pune that is PI Sarangkar. My gratitude to him and also to Road Stallions Pune. Hasan Radiowala was my Buddy for this attempt an ace rider & a great support, I must mention. From Pune to Kolhapur was a total disappointment as it was studded with traffic and we lost a lot of time out there. Later on I came to know that there is something like green corridor where in the cop van clears your route 1.5 km before you and no signals are a bother which requires permission from the SP of khed shivapur. We were cruising at 80 to 120 K mph most of the time and an average over all speed was 70. When we reached Bangalore the trouble began, we missed the nice road and a bypass to kurnool Hyderabad and entered the Bangalore city instead. Each flyover is like 4 km long in the city so if you take a wrong flyover you are done, you travel extra 8 km and the people are not receptive out there to guide you with the route. Also many of them don’t know the language English or Hindi. Lost almost an hour out there figuring out the right route. Somewhere 200 km before reaching kurnool my silencer got detached because of vibrations and fell off and was riding without one all the way. After taking a U turn from kurnool when I was heading towards Bangalore lost Buddy contact as Hasan’s and my phone both were on low charge because my bike charger was malfunctioning. So I was riding solo from 200 km before Bangalore to the finishing point that is Pune. At Bangalore again was searching for a RE workshop for fixing up of a silencer but couldn’t find one as the place is crazy. Studded with crazy traffic and confusing lanes, since my battery was low couldn’t use the GPS tracking as well. Lost 2.5 hours out there in Bangalore city. Finally somehow reached Satara which is where my 2415 km got done and from Satara to Pune was the craziest of rides I have ever had. I was sleepy because I was riding for 1.5 days and pot holes were innumerable, the cold was cutting through my skin despite the riding jacket and trucks were creating a chaos. Only I know how I have covered that last stretch. The journey is more important than the destination. The journey will always be remembered by me for the rest of my life, destination will be forgotten. *4 th Degree Black Belt in Military Martial Arts. *Apprentice Instructor in Bruce Lees JKD. *Trained Anti terrorist squad Mumbai. *Long Distance Riders Certification 1610 km in 24 hrs. 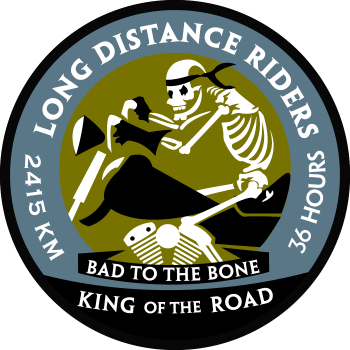 *Long Distance Riders Certification 2415 km in 36 hrs. Pune Police, Goa police, Maharashtra police, Indore police.